PayPal could be used as alternative payment method. PayPal is an e-commerce business allowing payments and money transfers to be made through the Internet. PayPal serves as an electronic alternative to traditional paper methods such as cheques and money orders.. Visit PayPal homepage to learn how this system works. Step 1: Register to PayPal (or note your PayPal email address if you are already registered). Step 2: Go to nomination a design page and click the design you want to nominate. Step 3: There is a link under this page, next to the nomination button it says:"By default, payments are made by "Credit Card". If you need to pay with other methods (such as Bank Transfer, Electronic Money, Paypal, etc) click here instead." click on this link (this is a dynamic link that changes with each design). Step 4: A new page "Payment with other methods" will appear, choose Award Category and continue by pressing "CONTINUE PAYMENT" button. Step 5. In this page, from the "Payment Method" menu choose PayPal. Step 6. Enter the reference number as your PayPal email to AUTH/REFERENCE CODE field and press "CONTINUE PAYMENT". Step 7: "Payment by PayPal" page will appear, there is a button that says "Buy Now", click on this button and you will be redirected to another page. Step 8: Pay through PayPal by either logging in or through following their interface. 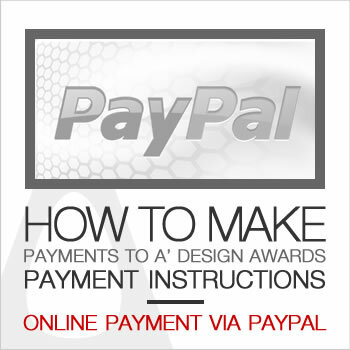 Step 10: You will be redirected back to A' Design Award. We will then manually confirm the payment.